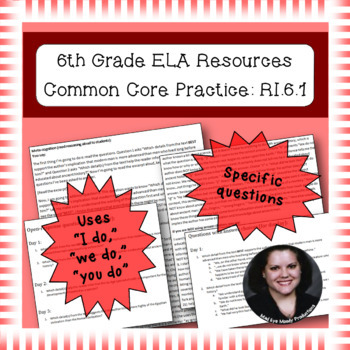 Use this NO PREP resource to give your students targeted Common Core or LAFS Reading: Informational Text practice! →Important note: Because of how the state of Florida altered their standards (to become the LAFS), this resource IS appropriate for the LAFS as well. It aligns to LAFS.6.RI.1.1. In this CIM, there are 3 lessons designed to take under 10 minutes each. They can be done together on a single day (although that is not the intent of the product) or on 3-5 separate days. All 3 lessons use excerpts from “Ancient Man: the Beginning of Civilizations,” by Hendrik Willem Van Loon. This text is in the public domain. All excerpts are appropriate for sixth-grade students, based on a variety of readability calculators. This CIM uses the "I do," "we do," "you do" model of instruction. Lesson 1 has 2 questions. Lesson 2 has 1 question. Lesson 3 has 1 question. 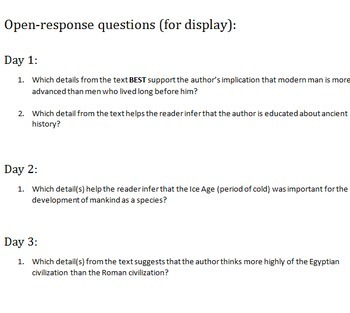 The questions can be used as either multiple choice or short/extended response. The questions are not exhaustive of those that could be asked for this standard, but are a good place to start. 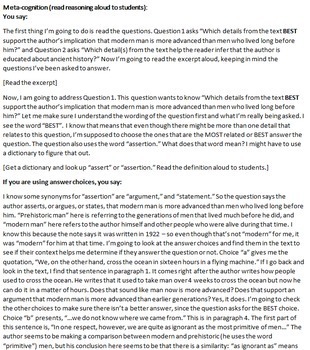 This product is a .zip with 3 separate files: the teacher version (with script), student version without answer choices (open-response), and student version with answer choices (multiple-choice). Student versions may be copied and distributed as necessary for purchasing teacher's classes. 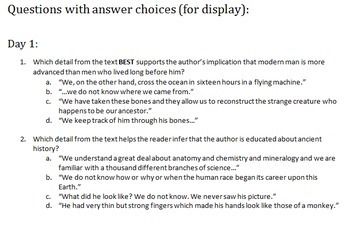 The teacher pages include the questions for display (both with and without answer choices), the excerpts for display, and the teacher script. This product is in .pdf format, but for an editable version, please contact me for details.